MAP Pricing, e-mail sales@clarksonlab.com for the best price. The HI96724 meter measures the free and total chlorine content in water samples in the 0.00 to 5.00 mg/L (ppm) range. The method is an adaptation of the USEPA Method 330.5 for wastewater, and Standard Method 4500-CL G for drinking water. The HI96724 incorporates an advanced optical system based on a special tungsten lamp and a narrow band interference filter that allows the most accurate and repeatable readings. 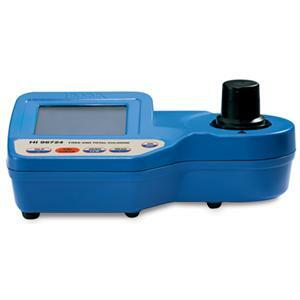 The instrument is factory calibrated and the electronic and optical design minimizes the need of frequent calibration. With the powerful CAL CHECK™ validation function, you are able to validate good performance of the instrument at any time.The validation procedure is extremely user friendly. Just use the exclusive HANNA ready-made, NIST traceable standards to verify the performance of the instrument and recalibrate if necessary. The instrument is water resistant and the lamp and filter units are protected from dust or dirt by a transparent cup. This makes the instrument ideal for field applications. Display messages aid the user in routine operation. The meter has an auto-shut off feature that will turn off the instrument after 10 minutes of non use in measurement mode or after 1 hour if left in calibration mode. The meter uses an exclusive positive-locking system to ensure that the cuvet is in the same position every time it is placed into the measurement cell. It is designed to fit a cuvet with a larger neck making it easier to add both sample and reagents. The cuvet is made from special optical glass to obtain best results. The reagents are in liquid form and are supplied in dropper bottles. The amount of reagent is precisely dosed to ensure the maximum repeatability. HI96724 is supplied with sample cuvettes (3) with caps, 9V battery and instruction manual. instrument quality certificate, instruction manual and rigid carrying case.